We continue to add new antibodies. 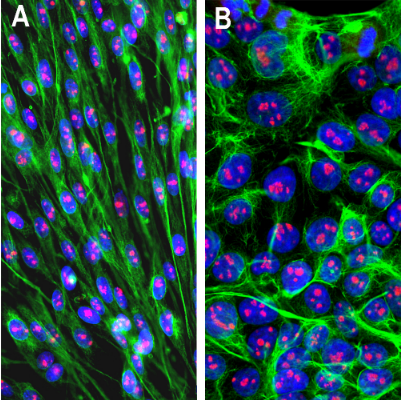 Many are additions to our frequently used and widely published Neuron-Glial Markers. All our products are tested, characterized and research ready. Image: Immunofluorescent analysis of cortical neuron-glial cell culture from E20 rat stained with mouse mAb to GAP43, MO22170, dilution 1:1,000, in red, and costained with chicken pAb to MAP2, dilution 1:10,000, in green. The blue is DAPI staining of nuclear DNA. 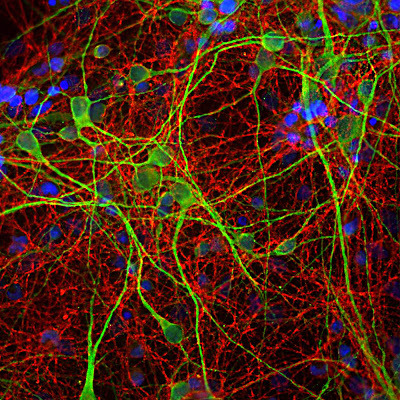 GAP43 antibody labels protein expressed in the axonal membrane of the neuronal cells, while the MAP2 antibody stains dendrites and perikarya of neurons.